We then contact you via email to confirm your membership and give you your member event discount code. That’s it! Or… read on for more information on why you should join, who can join, and the range of membership levels. Wynnum Business, in conjunction with WynnumCentral and other local groups, holds community events and promotions aimed at the local community. 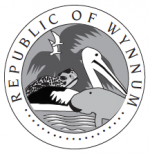 Associated entity WynnumCentral already provides a news and information service to local residents (~12,000 people live in Wynnum) via its website, email updates and social media pages. Over 2,800 locals subscribe to its email update ENEWS and anything up to 7,000 people visit and read news on the website every month. All Wynnum Business members are acknowledged on the site as supporters and are profiled in the news section with at least one article per year (more promotional opportunities are available to Wynnum Business members at different membership levels). In 2018 the site was upgraded to make it much easier to access and read from a mobile device. Wynnum Business members are automatically included in a business directory on WynnumCentral and one on this site. Wynnum Business invites specialists and experts in various fields of business to speak at our meetings. Every month (except June and December) there is at least one networking meeting – either in the morning (7am-8am) or in the evening (6pm-8pm) or over lunch (12pm-2pm). The meetings run to a fixed schedule and in a way that maximises networking opportunities. Participation is subject only to a nominal booking fee for members – this is a 50% discount on the standard ticket price. 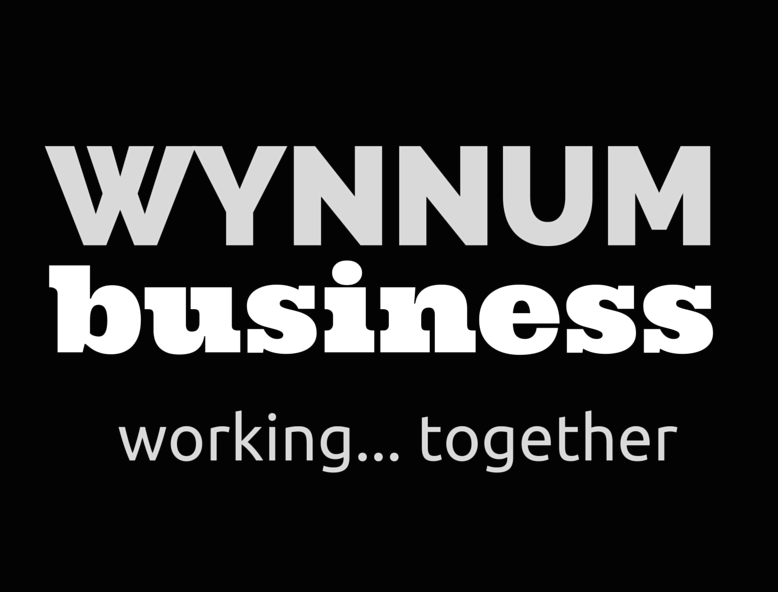 Wynnum Business of course also welcomes non-members who would like to come along to its events. More information below. Wynnum Business engages with government at local, state and national level to make sure that the views and wishes of members are made known to government and local representatives. Wynnum Business canvasses the opinions and views of members on a regular basis via online polls and surveys. Results are shared with the local population, the media and government. Fees start at $25 $20 inc GST per month* for standard membership if paid via credit card or via direct debit, with silver and gold levels for larger organisations. Membership can be cancelled at any time after the first three months of membership. 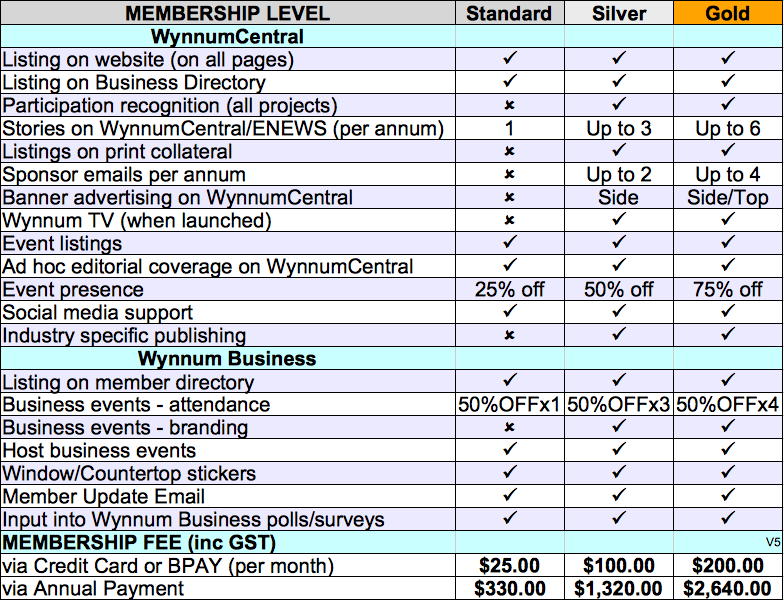 See the table below to work out the best membership level for your business. All members in addition receive small window and countertop ‘Wynnum Business Member’ stickers. Membership is subject to our Membership Terms & Conditions. If you run a business based in Wynnum or in the surrounding suburbs, you are eligible to join Wynnum Business. Joining Wynnum Business is straightforward. Membership is month-to-month after the first three months of membership (no annual renewals, unless you prefer to join this way) and you can cancel whenever you like after month 3. You may pay your membership fees annually if you prefer, however we strongly encourage you to pay either via a monthly credit card payment or via a monthly BPAY payment and we give a discount to Members using either of these methods (it substantially minimises our paperwork, allowing us to focus on delivering services to you). Please check the notes below for more information on membership benefits. These listings appear on WynnumCentral (WC) website (all pages), and in the business directory on the site. WynnumCentral has run various promotions to support its members, for example WynnumCentral shopping vouchers, treasure hunts, street events such as the markets, and in-app promotions. See below for a listing of proposed promotions this year. These are news items on the WynnumCentral website. These stories are also sent via email to subscribers (via ENEWS) and shared on the WynnumCentral Facebook page. Members are given the option of approving the article before publication. From time to time WynnumCentral/Wynnum Business runs events/promotions and produces printed material about these. Members at Silver Membership level and above are listed on any printed material. This is a separate email sent to subscribers and marked as a sponsor promotion (ie advertisement) on behalf of the member. This refers to the banner spots at the side and the top of every page on the WynnumCentral website. WynnumCentral is starting ‘TV news’ style video coverage of news, local business and events shortly. Silver members and above are included in this project. Any events member organisations are holding can be listed on the events page on the WynnumCentral website and on social media. At the discretion of the editorial team, other editorial coverage of special events/promotions of individual members can be covered in the news section on the WynnumCentral site. Where WynnumCentral/Wynnum Business organises events (eg business exhibitions/markets/other events), members can take spots/stalls/tables etc at a discounted rate. WynnumCentral has an active Facebook page, as well as Twitter and Instagram accounts. Wynnum Business has a Facebook page and a LinkedIn page. Members receive active mentions on social media platforms where they are active (ie post sharing, retweeting etc). WynnumCentral has run a property/real estate section (Property of the Week) and will also run other industry specific features in the future. This type of support is available to Gold level members. Attendance at business events is at a 50% discount for Members. Standard membership allows one person from the organisation to attend, Silver membership allows three attendees and Gold four attendees at member rates. Silver and Gold level members are recognised at all events, both mentioned by the MC and in terms of any collateral.